Drum Corps International Tour Event Partner Charles Mullen passed away on March 31. 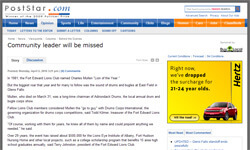 He was the chair of the Adirondack Drums DCI Tour event which has taken place in Glens Falls, N.Y. for nearly 30 years. Mullen is remembered in the Glens Falls Post-Star for starting the Adirondack contest amid skepticism from local officials, quickly proving them wrong by hosting an event that drew more than 6,000 people in its very first year. Read the article on PostStar.com. 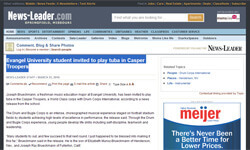 Joseph Brueckmann, a student at Evangel University in Springfield, Mo., is featured in the Springfield News-Leader for his acceptance as a tuba player with the 2010 Troopers. "We are excited for Joe," Michael Kolstad, chair the music department at Evangel University, said in the article. "It takes a very high level of musicianship and commitment to participate in DCI. We look forward to following Joe's progress throughout the summer." Read the article on News-Leader.com. 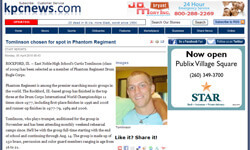 Curtis Tomlinson is featured in his hometown paper for earning a spot with the 2010 Phantom Regiment trumpet section. "Each year, Phantom Regiment auditions hundreds of young people from more than 25 states and several foreign countries, so Curtis' selection is a huge achievement," Phantom director Dan Farrell said in the article. Read the article at KPCNews.com.